Name your .MP3 or .WAV files with a leading zero since we burn the files in alphabetical order. Create a .zip or .rar file if your .MP3 or .WAV files. Before we burn the Audio CD, we unzip your .MP3 or .WAV files and use them to create a true Audio CD. Upload the zip file directly to the TrepStar project. You may upload to your server or cloud service (like Amazon S3). Please read this first. This contains very important information about the difference between audio CDs and data CDs. If you have the WAV or MP3 files, it's time to create a folder on your computer for each CD you plan to make. Place the MP3 or WAV files in that folder. Name your MP3 or WAV files in alphabetical order: We sort them that way when we burn them. Number your track file names, making sure to use leading zeroes. This will ensure we burn them in the order you want them played. Alphabetically, 10track.mp3 will sort BEFORE 9track.mp3! This is why you should use leading zeroes (09trackname.MP3 sorts first before 10trackabc.MP3). It does not matter what you name your files as long as you use leading numbers with leading zeroes. It's OK to give them meaningful names. Bit Rate: (you may choose). We recommend 192 or higher so the quality is good. A true audio CD can be at most 79 minutes in total play time. If your recordings are more minutes than that, either break them down into multiple disc sets or modify your project and make it a Data CD. A Data CD is not limited by total play time. It's limited by file size only. For example, a Data CD of .MP3 files can play for hours in a computer, some car cd players, some game systems and some bluray or DVD players. The drawback is that a data cd is not going to play in an older CD player. A Data cd of MP3 or WAV files can easily be imported into iTunes from your computer for example. If possible, you should try to make your discs 74 minutes or less to be compatible with most cd players. The problem is that some audio files can be burned to high capacity discs like ours, but the last track or the last part of a track might not fully play in all cd players. To be most compatible, try to keep it under 74 minutes. If we try to burn your audio cd and our system gives us an 'insufficient space' error, we'll have to inactivate the project and you'll have to edit down and shorten the disc, or add a 2nd disc to the set (split it up into another disc). 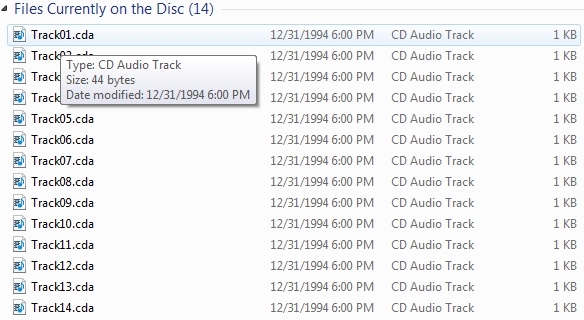 The names of your files are not very important for true Audio CDs. When an audio CD is made, the files are renamed as Track01.cda, Track02.cda ... If you look at the image, you can see the information a computer will see when an Audio CD is loaded. It does not matter what you've named your .MP3 or .WAV file. Once the Audio CD is made, the file names change. However, some CD Text data is stored on the Audio CD that does contain some of your file name and publisher information, but that is not important when played on a standard CD player. Zip up your .MP3 or .WAV files into a single .zip (or .rar) file. Each disc is a single .zip or .rar file. Before we burn the audio CD, we unzip the files first, and use those .MP3 or .WAV files to make the audio CD. 1) You may upload your file directly to the TrepStar Project. Edit your project, click the green upload button, and select your zip file. 2) You may upload your file to your website, then edit the TrepStar project and type in the URL to that file on your server. With true audio CDs, the names of your WAV or MP3 files are not important and do not get saved to the disc. They are lost when burning an audio CD. You can give your files a descriptive name but that name is only stored in the CD text. To have iTunes and other services recognize your new music cd, You need to upload the track and CD title information to the free service at GraceNote.com. You can also add this data on your own computer through iTunes after importing your cd to iTunes. Then the titles of the tracks and the CD title will appear when the CD is uploaded on any computer to iTunes or Windows Media. For audio CDs, only .MP3 or .WAV are allowed. You can not have an audio CD contain .pdf files for example. That type of disc would be considered a data CD that would play in a computer and have a 700MB capacity. If that's all you need, change your project options and pick a data cd. You may also consider creating a DATA CD containing many MP3 files. CDs can hold about 700MB of data. A DATA CD of MP3 files could easily hold over 100 songs, but those files would need to be played in modern devices a computer, PSx, XBOX, modern CD/DVD players, modern car CD players that would recognize those formats (MP3). However, data CDs are not compatible with old CD players, or older car CD players or boomboxes. You would want to make a data CD of MP3 files if you wanted customers to use your disc in their computer, or import it into iTunes from their computer. You can store hours of audio on a data CD if it's in MP3 format since a song in MP3 format is usually about 10 times smaller in file size than a WAV file of the same length of play time. Some newer Car CD players can play data CDs that contain .MP3 files. The actual files you give us are converted to .cda files. These files are created by our system when the disc is burned as an audio cd, and the source .MP3 or .WAV file is used to create these files. The total play time is just under 79 minutes but we recommend you limit your CD to 74 minutes to best most compatible with all audio CD players..